Create and name the new procedure and select the tool you will use to create the report. Expand the FINANCIAL project folder under Projects on localhost. Open the Master Files folder and click the binoculars icon to expose the list of available data sources. Scroll down and locate CENTGL.MAS, then right-click and choose Add to project. Repeat this process for CENTSTMT.MAS. Click the binoculars icon again to toggle back to the list of Master Files that are active for the FINANCIAL project. You will see only the selected master files. Click the Procedures folder. You will see the INCOME1 report you created in the first tutorial. To start a new procedure, right-click the Procedures folder and choose New, and then Procedure. The Add Procedure dialog box opens. 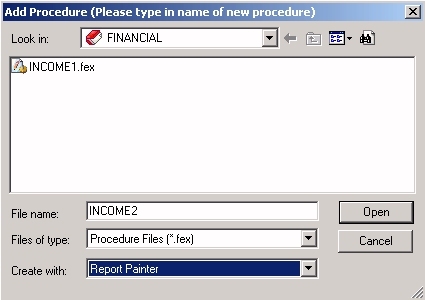 Name the procedure INCOME2 and choose Report Painter from the Create with drop-down list. Before the Painter opens, the Open dialog box asks you to specify the data source you will be using to create your report. 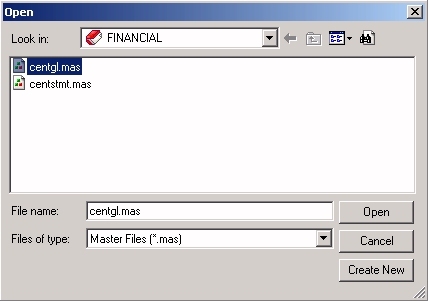 Select centgl.mas and click Open. Report Painter opens, displaying the fields of the CENTGL data source in the Object Inspector. CENTGL is one of two data sources you will need for your report. Your next task is to join the two data sources so that the fields from both will be available to you.